If you’re driving around in your truck and want to start using a Truck GPS unit, then you need to realize that you cannot simply buy a standard car gps off the shelf as you will run into problems. When you’re driving around in your truck, you need to think about what streets you can drive down and which you cannot other you could find yourself driving down a road that has a really low bridge half way along that you cannot fit under. The consequences of this are really not worth thinking about and at worst case will probably ruin your day. Choosing the right Truck GPS device can be challenging as you need to find a device that you can trust and almost put your life in its hands. A truck GPS navigation system will work by calculating the best route for you based upon a criteria that fits into your trucks dimensions. It will therefore take into account your trucks length, width, height and weight meaning that any routes that it calculates for you, will take you around low bridges or restricted roads. ​Typically these types of satellite navigation systems also come with much larger screens to allow you to see you device from across your cabin and also to allow for much more information to be shown at any one time than a standard GPS system. Typically they will also come with dual-screens meaning that at any one time you can view both your direction to your destination and other information such as the weather, your current speed, the speed limit and even the gradient of the slope that you’re driving down. As an added bonus, the points of interest databases in truck specific models will also be different given that overnight truck stops will more than likely not be shown on a standard GPS unit. Screen Size – Look out for the larger screen sizes above 6-inches as these are easier to see especially when they are located on your truck dashboard. Larger screens are also easier to use especially when you’re wearing gloves. Detailed Mapping – Look out for units that come with zoom images that offer the ability to zoom all the way into street level and use 3D Maps for streets and highways. Turn-By-Turn Directions to include the ability for your gps navigation unit to show you which lane you should be in at any complex interchanges. Weather Forecasts – Ask any trucker and the worst thing they face apart from traffic is the weather. Look out for gps unit that can give you a weather update and keep you out of any storms or snow jets. Customizable Features – to include the ability to enter your trucks length, width and height and ensure that our direction are calculated taking into account these dimensions to ensure that you avoid any low bridges or restricted zones. Trucking Driver Assists – these could include trucking gas stations or over night locations where you can park your truck and spend the night. Extra Features – Estimation of fuel cost, saving preferred routes, toll roads and the cost, Trip Logging with automated log monitor and driver information such as average fuel consumption speed and time to destination. Last year we reviewed a selection of best truck GPS units on the market and came to the conclusion that whilst there was competition on the market, the best truck gps device was the Garmin Dezi 760 LMT given it’s fantastic 7-Inch screen, easy to use menu system and more importantly fantastic routing that takes into account your trucks dimensions. 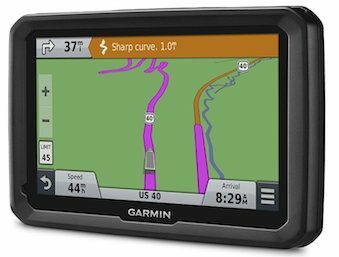 In late 2016, both Garmin and TomTom have brought out new truckers gps models and thus given the lack on new worthwhile models from other brands, the 2017 award the for the best gps for truckers will defiantly go to either a TomTom or a Garmin. TomTom have brought out the TomTom Trucker 6100 that is a fantastic trucking gps unit that truckers are going to love using. The key problem is that whilst TomTom offers free lifetime maps updates, traffic alerts are only free for a year and then you have to take out a subscription service that is going to cost you extra. If you can get upgraded each year, then I am sure the TomTom is worth, if not get yourself a Garmin that will come with free lifetime map updates and more importantly free Lifetime traffic alerts. The problem is that you now have a choice of three Garmin Models, the out-going Dezl 760LMT, the Latest 770LMT and the Garmin DezlCam Truckers GPS unit. Our feeling is that if you want a Dash Cam, then buy a dash camera which rules out the DezlCam, and whether you want to the 770LMtT or the 760LMT really depend on your financial situation as there is very little difference between the two models. The all new 770LMTHD does come with digital traffic updates which does seem to work better especially in cities and the screen is a little better in both pitch black and direct sunlight, however it's twice the price. In this section we're looking at truck gps reviews and our written reports from our tests over the last few years. We have split the best gps for truckers reviews into two sections, the 2016/2017 Truck gps reviews and the 2015 truck gps reviews. The Truck gps reviews is the section we we have reviewed every best rated truck gps on the market that you should be looking at buying if you’re really going to buy a new truck navigation unit. As with always we would highly recommend that you stick with the two brand names within the zone, Garmin and TomTom as even more than usual, you cannot rely on a simple import to give you directions when the consequences could be that you’re will drive down a road and have to reverse all the way back as there is a low bridge that you cannot get under. For this reason we have left out many of the cheaper imports and trucking gps units that you could buy, but you probably should not be buying. Garmin and TomTom have spent years mastering their designs to ensure that you have the best truck GPS unit possible and it calculates the shortest route, whilst avoiding any low bridges or restricted Zones that you cannot enter in your truck. The Garmin Dezl 770 LMT-D Trucker’s GPS unit is part of Garmin’s all new Dezl Range of Trucking GPS units and comes with a range of two models with our favourite being the 770LMT-D which comes with a 7-Inch dual orientations screen and a fleet of features that have be specifically designed to help you get your truck from A to B, however if you’re driving a van or a small truck then you could go with the Garmin Dezl 570LMT that comes with a 5-inch screen. We like the 770LMT given it comes with a 7-inch screen that will offer the flexibility to see your directions whilst at the same time altering your location whilst your wearing gloves, given the screen is a glove friendly screen. As soon as you switch on the screen, you’re directed to a screen where you can enter your trucks length, width, height and weight meaning that your trucking gps will calculate routes taking into account your trucks dimensions and any traffic along your route. 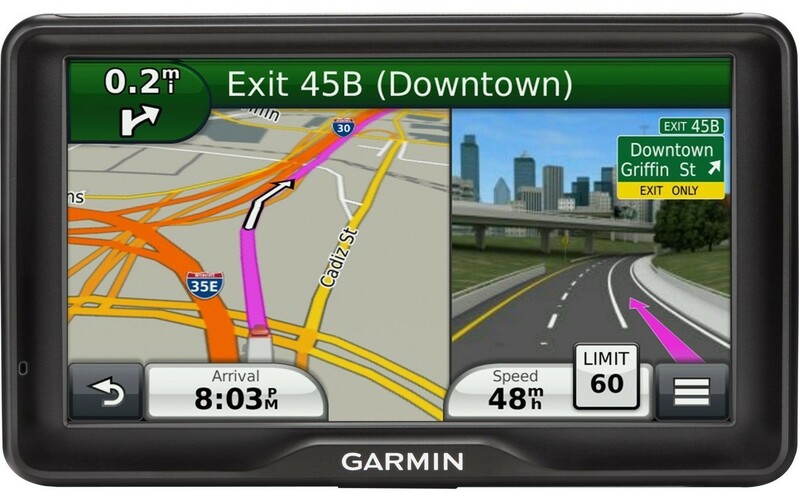 The Garmin comes with free lifetime traffic updates that allow you to stay out of the worst of the traffic, whilst the free lifetime map updates mean that you are always driving on roads that exists in your gps unit. Maps are great and provide detailed routes and building locations to help you find your destination, whilst if you reach a difficult junction, the unit switches to a dual orientation screen meaning that on one side of the device you have your route and directions and the other lane guidance showing you which lane you should be in. Bluetooth comes as standard meaning that you can make a receive calls using the in-built speaker and even connect the wireless back up camera to help you when you need to reverse your truck. Overall the Garmin Dezl 770LMT is a cracking sat nav unit and the free lifetime map, traffic and speed camera alerts will help you keep your sat nav working and up to date for the foreseeable future. 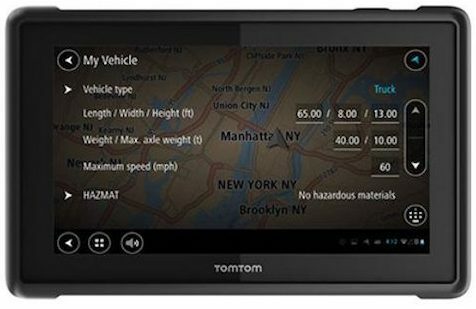 The TomTom Trucker 6100 is TomTom’s all new and improved trucking specific gps unit that have been design specifically for truckers in mind. We like this unit and the features that comes with it, but as with many of the latest TomTom gps units, you need to read the small print to find out what exactly yours comes with as standard as this does vary between models. The standard model does come with free lifetime maps updates however it only comes with one years free traffic alerts after which you’re going to have to either buy a subscription or run without traffic alerts which does not really make sense given the model above and the model below, both come with free Lifetime Map and Traffic Updates. The Trucking gps comes with a superb 6-Inch screen that allows for the maps that are 3D Maps meaning that you can easily see buildings and landmarks in both low light conditions and in direct sunlight conditions. Like all trucking gps units, the 6100 allows you to enter your trucks dimensions that have it calculate routes based on the traffic conditions and your dimensions therefore helping to avoid any fines or being stuck in traffic. Overall, it’s a great mode, but unless you are planning to change next year or you really have to have a TomTom, buy the Garmin above and get yourself free traffic alerts and map updates for the life of your gps unit. The Garmin DezlCam Trucker’s GPS unit is part of Garmin all new 2016 range of trucking gps units but one that comes with a slightly different take on what a gps unit should be given that it offers both turn-by-turn, step-by-step directions on a large 6-inch screen, but also a camera that provides both front and back recordings to help you decide whose at fault if you are even in an accident. For the gps side, you can see it has been designed for truckers in mind given that when you first switch on the gps unit you can enter your trucks dimensions meaning that it only calculates routes that you can fit down, however it also comes with the camera which records in 720 resolution, video that is saved onto an 8GB card that works on a loop system meaning that you can continually record onto one SDcard. If you get into a collision, the Incident Detection system automatically saves the footage meaning that you can play it all back with the touch of a button. Overall we like the Garmin Dezl-Cam, however the key problem is that the camera is not as good as it should be and therefore the video does suffer in low light conditions and having the camera means that the unit is much bigger than it should be and also more expensive. If you want a dash cam, buy a dash camera, however if you want a gps for your trucks then buy the 760 or the 770LMT above. 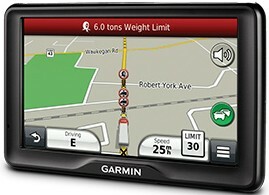 While the TomTom Pro Truck is firmly our favourite truck GPS unit, the Garmin Dezi 760LMT is a very close second. For us and most importantly, when you’re buying a Garmin GPS you know you’re buying quality and this Dezi 760LMT is no exception. 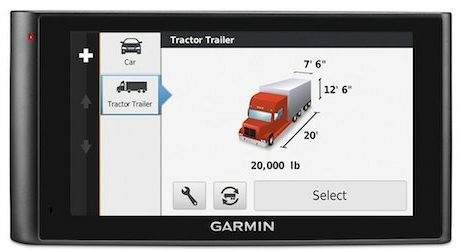 The Dezi 760LMT is garmin's latest attempt at a Trucking specific GPS Unit and comes with a super 7-Inch touchscreen, all new faster processor, bluetooth compatibility, Traffic Alerts and Free Lifetime Map updates. The 7-inch screen comes with WVGA TFT Technology to help with colors even when the unit is in darkness or in direct sunlight and does a f﻿﻿﻿antastic job of providing the user directions that can actually be seen even when in direct sunlights. Directions are in the form of turn-by-turn directions through an in-built speaker system. It start the GPS directions you first need to enter your trucks height, weight, length and width and the address of the destination that you want to travel to. The unit will start and quickly find a route that get’s you to your destination without taking you along routes that you’re too big for. If whilst trucking along your route you come to a super difficult junction the screen will split into two with one side of the GPS screen giving you directions, whilst the other side giving you a graphic image showing the highway and the lane that you need to be in to take the right direction to your destination. Other features include voice-activated navigation allowing you to control your Truck GPS with your voice, bluetooth allowing you to connect your phone to your truck gps and take advantage of the in-built speaker, traffic alerts meaning that your truck GPS device will take in account any on-coming traffic jams when it calculates your route and most importantly a massive points of interest database that will show you over 6 million truck specific points on interest such as truck stops or gas stations. 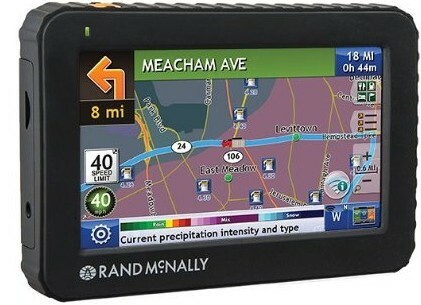 Whilst we do talk lot about the two major brand named GPS manufactures and highly recommend that you buy a brand name as its likely to work better in the long term, when it comes to Truck GPS navigation systems, Rand McNally TND have been making trucking specific GPS Units﻿ for over 70 years and therefore should be taken seriously when you’re buying a truck navigation system. The Rand McNally TND 720LM has over 35% more useful features when compared to other trucking specific GPS units on the market today designed all to help you get to your destination on time with the minimum number of problems. The Truck navigator comes with a high resolution 7-Inch screen and a fantastic in-built speaker that even has the volume to allow you to hear your directions in the summer months when you’re driving along with the windows down. Once you have entered your truck's height, weight, length and width and the address of the destination that you want to travel to the truck navigator calculates the best route for you, whilst taking in account the route, traffic and even the weather and gives you turn-by-turn direction to help you get to your destination. If you come to a difficult junction that you’re not sure exactly which lane you should be in, the navigator switches into junction view which provides a 3D image of the approaching junction and active lane guidance which shows you which lane you should be in to help you manage complex interchanges with bright arrows to show which lane you should be in. As an added benefit the Rand McNally trucking navigator connects to the internet through it’s WiFi portal which brings a whole host of extra features to help you get your truck to it’s destination. These extra features include current and forecasted weather data to include wind speed along your route, Road Work construction updates and enhanced truck routing options such as Exit Quick View to help find truck-friendly locations along your route. The TomTom Pro 5150 Truck GPS Unit is the best truck specific GPS unit that we have ever tested. Yes it’s the most expensive unit that we have ever tested, however you’re buying a GPS device from one of the world's top GPS unit manufactures and as a result you know that you’re buying quality. The TomTom Truck comes with a massive 5-inch, high resolution, crystal clear screen that really allow you to see your screen whether it’s day or night, sunshine or showers. Inside the unit is the latest TomTom process which helps to run a fantastic interface that means moving around your GPS is very easy, the maps are fantastically detailed, the navigation instruction are perfect and most importantly, your route calculations are very fast and you can set your route calculations to take into account your truck's dimensions so that it does not take you down any streets are not possible for your truck to drive down. The TomTom Truck pro also comes with a fantastic touch screen menu and given the super screen meaning that you can still touch the unit’s screen even though you’re hands are dirty or you’re wearing gloves. This means that you can easily enter your destination using the predictive text design. The maps are very detailed and show you both the layout of the roads and streets, but also the contours on the land. Directions come very easily meaning that turn-by-turn directions are given to you as you drive along and when you enter a junction that is very complicated, the GPS automatically switches into junction mode which use TomTom’s active lane guidance to show you which lane you should be in to follow your directions. Extra features include speed alerts for any speed cameras, your current speed and the road speed, bluetooth for connecting your unit to your phone and a points on interest database that has million of points of interest that are all trucking, RV and motorhome specific meaning that if you want to stop over night to sleep in your truck, your GPS Unit device will help you find one. 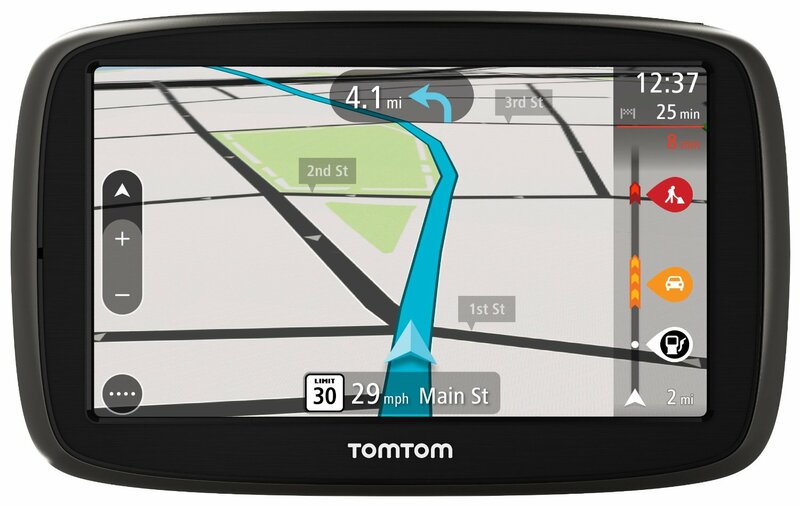 The Best Cheap Car GPS Under $100?